To determine the health of a city, several parameters need to be considered. The proposed project aims to probe and understand two specific aspects of city health: road infrastructure and pollution-levels. We propose a city-scale pervasive sensing framework, CityProbe, which seamlessly integrates customized sensing units and mobile phone sensors. The proposed solution scales by leveraging crowd-sensed reports from customized and mobile phone sensors, to monitor air and sound pollution levels and to detect poor road conditions, in real-time. 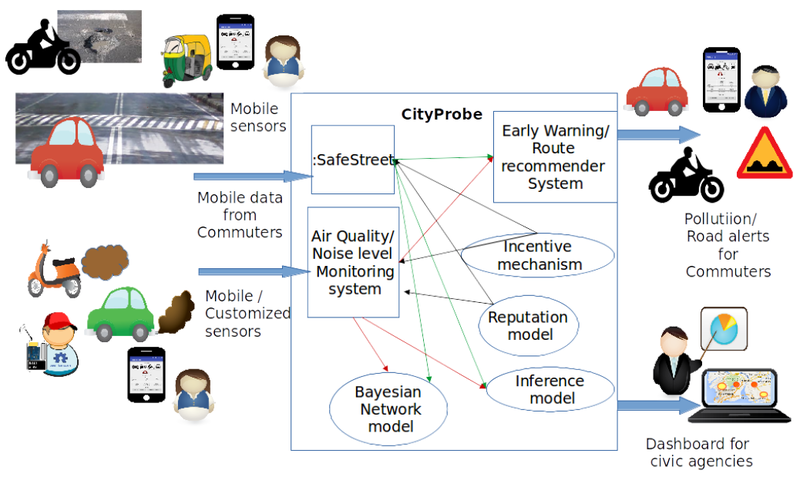 CityProbe is novel in incorporating both participatory and automated detection techniques; and in being a first-of-a-kind framework that explores causalities between road conditions and pollution levels. A dashboard depicting the derived insights from the crowd-sensed reports will be presented to city agencies for assistance in policy-making; and citizens will receive customized alerts and recommendations related to travel conditions. We will field deploy our solution in three cities: Mumbai, Durgapur and Chandigarh.